It's been ages since I've done a Thirsty Thursday post, but I am starting to get back in the swing of things around here now that we're back and finally adjusted after our California trip. I don't know about where you're at, but the weather over here has been all over the place lately. Last week it was warm and nice and all this week has been a mix of being windy, snow, hail, slushy rain and thunder storms. We're getting it all and I'm hoping we get the sun back soon so I can enjoy the outdoors again. This week's Thirsty Thursday drink is what I enjoyed last week when it was nice out. It's easy, simple to make and only has two ingredients, yep, you heard right, two ingredients and that's it. I was trying to find something that was light and delicious to make and went to the store and found the new Crystal Lights Liquid Drink Mix. I grabbed a few different flavors, but came home and made a smoothie with the mixed berry flavor because I had some frozen strawberries and they just sound good together. Perfect for the entire family to enjoy! Make your cup of crystal light as directed on the bottle. 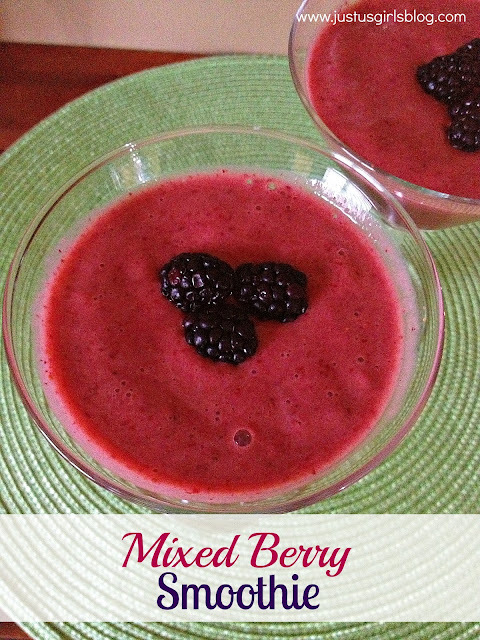 In a blender pour in your frozen strawberries along with one cup of crystal light and blend until smooth. Feel free to add more than one cup of crystal light depending on the consistency you want. Pour in glass and garnish with some fresh fruit and drink up.